Birdsfoot trefoil (Lotus corniculatus L.) is a legume mainly grown for fodder production in temperate regions. Birdsfoot trefoil is a short to medium-lived perennial legume. It is a sparsely pubescent plant with a habit varying from prostrate to erect. Erect forms can reach 60-90 cm in height. It is taprooted and has many lateral roots, mainly in the top 60 cm of soil. The root system can go as deep as 120 cm (UC SAREP, 2006). The stems grow from the roots or from the basal nodes on the stubble left after grazing or cutting. The leaves are alternate, pentafoliate with 2 lower leaflets resembling stipules, hence the name trefoil. The foliage is glabrous, slender and pale green. The inflorescences of Lotus corniculatus are umbel-like cymes borne at the end of axillary branches. Each inflorescence bears 8 pea-like, fragrant flowers, pale yellow to bright yellow sometimes tinged with red, hence the common name “bacon-and-eggs”. The fruits are cylindrical pods (2.5 cm long) at right angles to each other, hence the name "birdsfoot trefoil". The pods turn light brown to black when mature, and split open releasing 10 to 15 seeds. The seeds are very small, olive green to black in colour and hard-coated (FAO, 2014; UC SAREP, 2006; Hannaway et al., 2004). Birdsfoot trefoil is mainly used as fodder (FAO, 2014; Hannaway et al., 2004). Of the 4 domesticated Lotus species, Lotus corniculatus is the most important for fodder production (Sato et al., 2011). It is a high quality forage that can be grazed or cut for hay or silage, and does not cause bloat in ruminants (Hannaway et al., 2004). Two types, Empire and European, and at least 25 varieties are used throughout the world. Empire cultivars are decumbent, of intermediate size, and show the best persistence in heavily-grazed pastures. European types are erect, more vigorous, regrow faster after grazing, but are less persistent under heavy grazing because their basal buds are more easily eaten by livestock (Hall et al., 1993; Grant et al., 1985). Lotus corniculatus is also helpful for erosion control, revegetation and as a wildlife habitat (FAO, 2014; Hannaway et al., 2004). Birdsfoot trefoil originated from Europe, parts of Asia (Iran, India) and northern Africa (Mediterranean Basin). It has been introduced to many areas including Australia, North and South America. It can grow from sea level to an altitude of 3500 m. It does well in areas where annual rainfall ranges from 600 to 1500 mm, and where temperatures are above -5°C during winter and range from 20°C to 30°C during the growing season. Lotus corniculatus can grow on a wide range of soils and does best on soil with a pH ranging from 6.2 to 6.5 or above. It is tolerant of wet acidic soil (pH = 4.5) and has some drought tolerance. Birdsfoot trefoil can withstand some soil salinity. It thrives in places where alfalfa and other forage legumes cannot grow because of soil acidity and moisture. Birdsfoot trefoil has no tolerance of shading, particularly during the early stages of establishment and should be planted with slow-growing companion grasses (FAO, 2014; UC SAREP, 2006; Hannaway et al., 2004). Birdsfoot trefoil can be sown during spring or autumn, alone or with a slow-growing, non-aggressive companion grass. Pure stands provide high quality forage and are suitable for making hay. However, pure stands thin out more quickly than mixed stands (Undersander et al., 1993). In mixtures, timothy, smooth-stalked meadow grass and brome grass are suitable, non-aggressive species, but more competitive grasses such as cocksfoot or perennial rye grass can be mixed with birdsfoot trefoil (FAO, 2014). Mixing Lotus corniculatus with small-grain crops such as oats or barley is possible provided the small grain crop is cut or grazed early in order to prevent shading and subsequent decline of the legume (Hall et al., 1993; Undersander et al., 1993). Birdsfoot trefoil requires a well-prepared seedbed. The hard seed may be scarified before being broadcasted. The seeds should not be buried deeper than 1.3 cm (Grant et al., 1985), and weeds should be controlled to ease establishment. Mixtures of grasses and birdsfoot trefoil are less prone to weed invasion than birdsfoot trefoil sown alone. Companion grasses also prevent birdsfoot trefoil from lodging (Grant et al., 1985). After establishment on good quality soils, mixtures of birdsfoot trefoil and grasses yield 10-17 t DM/ha. Birdsfoot trefoil monocultures yield 6 to 14 t DM/ha (Bullard et al., 1995). Such high yields cannot be obtained on poor soils (FAO, 2014). Birdsfoot trefoil regrows from axillary and basal buds. Careful grazing/mowing management is necessary to prevent the disappearance of buds and it is advised not to mow the plant below 5-10 cm. Birdsfoot trefoil is sensitive to heavy grazing, either continuous or rotational. Light rotational grazing is suitable to ensure good regrowth (FAO, 2014). Under continuous grazing, stock pressure should remain low so that all the basal buds are not eaten by livestock. Under rotational grazing, rest periods of 6 weeks were found to be suitable for further regrowth. Some rest periods should also be provided so that birdsfoot trefoil can produce seeds and ensure the reseeding of the stand (Undersander et al., 1993). Prostrate cultivars are less sensitive to low cutting and overgrazing (FAO, 2014). In mixed stands of birdsfoot trefoil and grass, early grazing of the grass is necessary to promote the establishment of the legume. Once established, birdsfoot trefoil can be grazed at the early blooming stage (Undersander et al., 1993). Birdsfoot trefoil left ungrazed from early autumn until the first frosts allows the root reserves to accumulate, and also provides good quality forage during late autumn (Hall et al., 1993). 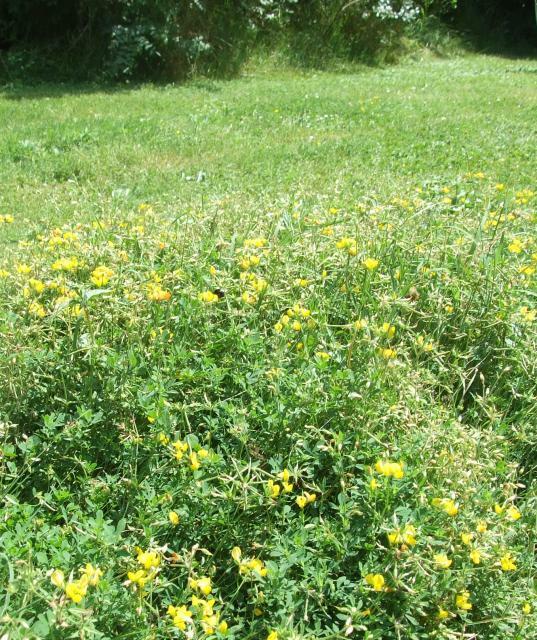 Erect or semi-erect cultivars of birdsfoot trefoil are best suited for hay and silage. Depending on the length of the growing season, birdsfoot trefoil will be cut 2 or 3 times, at 6-week intervals (Hoveland et al., 1985 cited by FAO, 2014). First cut should be done at 10% bloom with the second cut in mid-August. It is recommended not to cut birdsfoot trefoil during late summer and up to the first hard frosts in order to promote reserve accumulation in the roots and subsequent spring regrowth (Hall et al., 1993). Birdsfoot trefoil provides good soil cover, particularly if associated with tall fescue or a small-grain crop such as barley or oats (Hannaway et al., 2004; Hall et al., 1993). 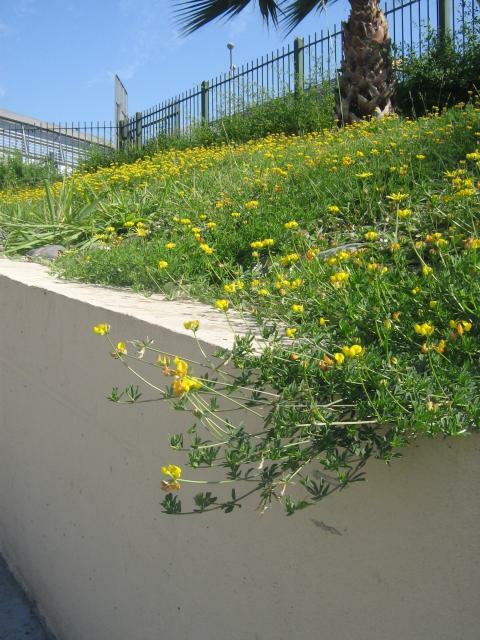 Birdsfoot trefoil can be sown along roadsides to prevent wind and water erosion (Bush, 2002). Birdsfoot trefoil is an N-fixing legume. When it makes up more than 30% of a mixed stand, it provides enough N to the companion grass to sustain its growth and no N fertilizer is needed (Hall et al., 1993). Birdsfoot trefoil was successfully used in soil reclamation (china clay sand wastes) in England where it significantly increased the yield and protein content of its companion grass (Jefferies et al., 1981). Birdsfoot trefoil provides good cover for wildlife (Bush, 2002). It is a good source of pollen for bees and bumble bees (Bush, 2002; Brian, 1951). Its flowers produce abundant and concentrated nectar and it is considered a valuable honey plant in North America (Canpolin, 2012). The condensed tannins in birdsfoot trefoil elicit reductions in CH4 emissions and urinary N in dairy cattle (Woodward et al., 2004; Williams et al., 2011). Though this reduction is partly offset by an increase in faecal N, it favours a reduction of N leaching and volatilization, which contributes to the reduction of eutrophication and greenhouse gas emissions (Aufrère et al., 2012). 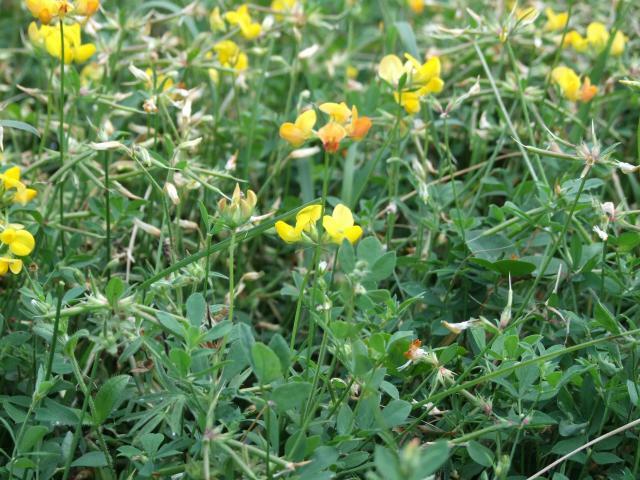 Birdsfoot trefoil is a good quality forage with a high protein content (15-28% DM). A major characteristic of birdsfoot trefoil is its high concentration of tannins. Its tannins are mainly procyanidins, which are known to reduce proteolytic rumen bacteria (Min et al., 2005) and protect protein from rumen degradation (by-pass) (Waghorn, 2008; Min et al., 2005). These tannins reduce urinary N excretion and prevent bloat (by reducing methane and ammonia emissions), together with anthelminthic activity (Waghorn, 2008). The concentration of condensed tannins in birdsfoot trefoil is variable, with values ranking from 2 to 55 g/kg DM, as determined with the HCl-butanol assay (Wang et al., 1994; Wang et al., 1996a; Waghorn et al., 1997; Adu et al., 1998; Hedqvist et al., 2000; Min et al., 2003; Robinson et al., 2007; Coblentz et al., 2013; Hymes-Fecht et al., 2013; Waghorn et al., 1987; Barry et al., 1999b).The composition of condensed tannins (ratio procyanidin/prodelphinidine, PC/PD) is also variable (Hedqvist et al., 2000; Min et al., 2003), although less documented (Aufrère et al., 2012). The content of condensed tannins in birdsfoot trefoil varies according to variety, particularly in leaves (Carter et al., 1999), but increases with maturity (Cassida et al., 2000), and is 3 times higher in rhizomatous birdsfoot trefoil than in non rhizomatous (Wen et al., 2003). It is also higher in birdsfoot trefoil grown with a tall fescue companion grass, and fluctuates between seasons (Wen et al., 2003). Unlike other legumes, birdsfoot trefoil does not cause bloat in ruminants (Hannaway et al., 2004). Birdsfoot trefoil is a valuable forage for ruminants. Legume-based swards including birdsfoot trefoil providing moderate concentrations of condensed tannins can be used to increase the efficiency of protein digestion and to improve animal health under grazing, producing more sustainable grazing systems. 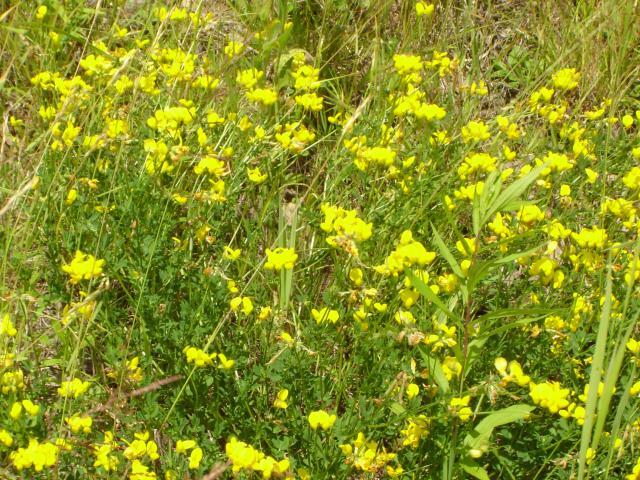 When compared to other plants rich in condensed tannins, such as chicory (Cichorium intybus) and sainfoin (Onobrychis viciifolia), harvested at the same stage, birdsfoot trefoil contained less fibre (NDF and ADF) and more protein, but its protein was more degradable (Cassida et al., 2000; Arrigo, 2012). The OM digestibility of Lotus corniculatus in cattle was comparable to that of alfalfa and sainfoin (Kraiem et al., 1990). The intake of Lotus corniculatus silage in sheep (71 to 81 g DM/kg LW0.75) was comparable to that of late-cut sainfoin and red clover (Trifolium pratense) silages, but higher than that of early-cut alfalfa and red clover (Fraser et al., 2000). The condensed tannins (2-3% DM) of birdsfoot trefoil did not affect OM digestibility in sheep (Waghorn et al., 1987; Wang et al., 1996c). With mixed diets, the nutritive value of fresh forages for sheep was not affected when the condensed tannins from birdsfoot trefoil (2.6% DM) did not exceed 1% of total dietary DM (Waghorn et al., 1997). However, high concentrations of condensed tannins (more than 5.5% DM) in birdsfoot trefoil reduced voluntary feed intake and digestibility, and depressed weight gain and wool growth in grazing sheep (Min et al., 2003). The content of condensed tannins in birdsfoot trefoil is related to other forage quality parameters. Plants with a high concentration of condensed tannins (6.9% DM) had lower, but less degradable, protein and lower in vitro digestible DM than low-tannins plants (2.1 g/kg DM). Lignin concentration was positively correlated with condensed tannins concentration (Miller et al., 1996; Hedqvist et al., 2000). In plants without condensed tannins, N degradability was high (78 and 89% for hay and silage, respectively), but N degradability declined with increasing condensed tannins concentrations (Miller et al., 1994; Hedqvist et al., 2000). Each unit of condensed tannins protected 0.61 units of protein (Coblentz et al., 2013), thereby increasing the duodenal flow of amino acids (Wang et al., 1996b), but the undegradable protein remained less than 24% of the total protein intake (Cassida et al., 2000). The effect of condensed tannins on degradability may be related to a specific effect on some proteolytic bacteria in the rumen (Min et al., 2002). The condensed tannins of birdsfoot trefoil have anthelminthic properties and have been reported to decrease nematodes in wild and domestic ruminants (Min et al., 2003; Novobilsky et al., 2011; Waghorn, 2008; Molan et al., 2001). Birdsfoot trefoil was reported to decrease dagginess and fly-strike in grazing lambs in New-Zealand (Leathwick et al., 1995). In dairy cows, birdsfoot trefoil with condensed tannins accounting for 1.6% DM increased yields of milk, protein, and solids-not-fat compared to birdsfoot trefoil containing 0.8% DM of condensed tannins. Overall, diets containing birdsfoot trefoil silage support greater production than diets containing alfalfa or red clover silage, indicating that feeding birdsfoot trefoil or other legume silages containing condensed tannins can enhance performance and N utilization in lactating dairy cows (Hymes-Fecht et al., 2013). Interaction between the condensed tannins of birdsfoot trefoil and preservation also occurs: with a high condensed tannins concentration (70 to 120 g of tannins per kg protein), hay provided sufficient rumen-undegradable protein (35% of total protein) to support 35 kg/d milk yield, whereas ensiling was required to increase rumen-undegradable protein with birdsfoot trefoil containing less tannins (Grabber, 2008; Grabber et al., 2009). However, in a comparison of ryegrass-legume silages, birdsfoot trefoil containing low levels of condensed tannins resulted in a higher milk protein yield than white clover (Trifolium repens), and had a protein-sparing effect in dairy rations (Eriksson et al., 2012). In ewes rearing twin lambs and grazing birdsfoot trefoil, the condensed tannins increased milk yield and the secretion rates of protein and lactose without affecting voluntary forage intake, thereby increasing the efficiency of milk production (Wang et al., 1996a). In grazing meat sheep, birdsfoot trefoil provided lower indole and skatole concentrations in body fat than a pasture of perennial ryegrass plus white clover (Schreurs et al., 2008). More generally, grazing finishing lambs on forage legumes rather on ryegrass makes it possible to increase growth rate and reduce time to finishing without compromising carcass quality (Speijers et al., 2004). In sheep fed birdsfoot trefoil, efficiency of both reproduction and wool production was improved (Min et al., 1999; Luque et al., 2000). The wool was of reduced yellowness (Min et al., 1998; Min et al., 2001). In grazing red deers and elk-deer hybrids, with the same DM allowance as from perennial ryegrass-white clover pasture, birdsfoot trefoil provided superior performance in terms of voluntary feed intake, daily weight gain (91 vs. 20 g/day), weaning weight (52.6 vs. 48.1 kg) and calf daily weight gain (485 vs. 399 g/day) (Adu et al., 1998). Birdsfoot trefoil has been used for a long time as protein-rich forage in European smallholder rabbit units. It has been considered as one of the most palatable fresh forage or hay for rabbits, and its culture was actively encouraged in France in the 20th century (Nollet, 1943). In the wild, birdsfoot trefoil is often heavily grazed by rabbits, for example in the United Kingdom (Jones et al., 1986). Used as the sole feed, birdsfoot trefoil hay harvested in 3 different cuts, and distributed with salt blocks and water to Dutch Belted rabbits, supported maintenance and a better growth rate than alfalfa (12.9 g/d vs. 11.5 g/day). Dry matter digestibility of the birdsfoot trefoil was also higher than that of alfalfa (48% vs. 45%) (Ingalls et al., 1965). 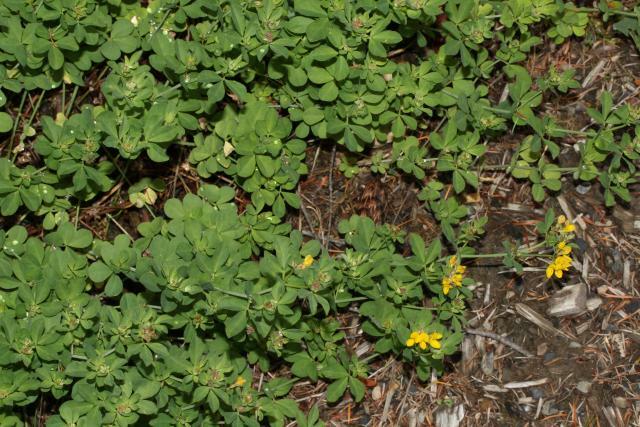 Introduced progressively in balanced diets for growing rabbits, birdsfoot trefoil was able to replace completely the alfalfa included at 32% in the control diet, without affecting growth rate or feed efficiency. In this study, the estimated DM digestibility (62%) was higher than that mentioned above when birdsfoot trefoil was used as the sole feed. The estimated digestible energy content for inclusion in a balanced diet was 11.42 MJ/kg DM (Grandi et al., 1988). Hannaway, D. B. ; Myers, D., 2004. Birdsfoot trefoil (Lotus corniculatus L.). Oregon State University. Species Selection INformation System. Nollet, R., 1943. Elevez des lapins. Collection Rustica, Editions du Montsouris, Paris, 126 p.
Robinson, K.; Bell, L. W.; Bennett, R. G.; Henry, D. A.; Tibbett, M.; Ryan, M. H., 2007. Perennial legumes native to Australia - a preliminary investigation of nutritive value and response to cutting. Aust. J. Exp. Agric., 47 (2): 170-176.